The phrase you often hear when people talk about external insulation is ‘like a tea-cosy’. It’s an image that captures the simplicity of the concept perfectly. You wrap the building in one continuous layer of insulation, preserving its thermal mass and eliminating thermal bridges in one fell swoop. Because the insulation is located outside the structure, its dew point lies close to the exterior of the building, which means the risk of condensation within is eliminated. The wide variety of materials and finishes available gives designers and builders ample choice, both from an engineering and an aesthetic point of view. It’s buildable, robust and creates structures that are warm, dry and healthy. 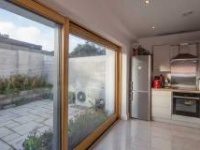 It’s not surprising therefore that so many of the passive and low energy projects we have featured in Passive House Plus over the years have included external insulation as a core element. Nor have these projects been restricted to new builds. External wall insulation, or EWI, is equally popular in retrofits, where – with best practise design and build techniques – it delivers very high levels of thermal comfort simply and efficiently. It’s also worth pointing out that when installing EWI, the cost of increasing the spec – going say from 100mm to 200mm – is nearly always minimal. The prime costs of the technology are the fixed costs: scaffolding, the fixings, the plastering. These elements don’t change much if you opt for a thicker profile; you’re only paying for the additional insulation materials. This is an important point. If you’re going to externally insulate a building, be as ambitious as you can. It’s not something that you will return to again. In both Ireland and the UK, grant level target U-values stand at 0.27 W/ m2K. This is an exceptionally poor standard to aim for – and will look a lot poorer with each passing year. When you consider the low marginal costs involved in securing U-values of 0.21 W/m2K or even 0.15 W/m2K, it makes eminent good sense to do so. In retrofit situations, external insulation brings the added benefit of giving the building a de-facto facelift. In any row of houses, it’s always easy to tell which one has had EWI installed. From a resale point of view, you’re not only boosting the energy profile of the house, you’re also improving the aesthetic. Suppose you’re retrofitting a 100 sqm three bed semi (5m wide by 10m deep on 2 floors) and you want to achieve a wall U-value of 0.21 W/m2K. Internally insulating the house would require about 85mm of rigid insulation finished with 12mm plasterboard and a 3mm skim coat. In total, that’s 100mm that you’re adding to the inside of the external walls of the house. The total length of the insulated wall is 40m [(5m+5m+10m)x2], and this in turn gives you 4 sqm of lost floor area (40m x 0.1m= 4m) which is worth about €2,695/m2, or €10,780 worth of real estate in the Dublin area at today’s prices. This is all without considering the disruption that retrofitting internal insulation involves – removing and refitting skirting boards, rads, sockets – and the associated co-ordination of trades that comes with that. Remember too that large sections of the house will be uninhabitable while the work is underway. One of the big advantages of EWI retrofits is that, depending on what other measures are being done, the occupants may not have to move out, which can have a significant impact on project cost. Though external insulation can sometimes feel like the new kid on the block, these systems were originally developed on the continent following the second world war, and saw their popularity increase substantially following the oil crises of the seventies. They have been in use in the US since the mid-sixties. 1-3 Bock walls externally insulated with 300mm KABE Therm platinum expanded polystyrene insulation, right down to the foundations, which prevents cold bridging at ground level. Expanded polystyrene, or EPS, is the most popular and least expensive insulation material used in EWI systems available on the market at the moment. The white EPS we’re all familiar with has been the mainstay of external insulation for years and has a typical thermal conductivity of 0.037 to 0.040 W/mK. More recently it’s been superseded by grey EPS, which is graphite enhanced and has a superior conductivity value of circa 0.031 W/mK. Effectively what this means is you get the same performance from a thinner profile. EPS is regarded as easy to work with. It’s lightweight, cuts easily yet is quite robust. It’s also well suited to our climate in that it can get wet during installation without suffering any loss of thermal value. Because it’s so common, you can get it in virtually any thickness you want. Another familiar material, mineral wool sits at the lower cost end of the spectrum and has a thermal conductivity in the region of 0.036 W/mK. It’s got the best fire proof credentials – mineral wool just won’t burn. This is one reason why it’s often specified in social housing and commercial multi-storey buildings, and why it’s used as a firebreak in other projects. It’s regarded as a little harder to work with; it’s more difficult to cut, and has that ‘itchy’ factor. It also needs to be kept dry during the install. Having said that, if it does get wet, its performance will return once it’s allowed to dry out fully. Mineral wool is fully breathable – meaning that any moisture/water vapour in the structure can pass to the exterior surface unobstructed. That said, as with all insulations, breathability is only maintained if the finish is itself breathable. Of this, more later. Among the most expensive but also the best performing materials on the market, it has a thermal conductivity of 0.021 W/ mK. Because it’s such a high performance material, it’s sometimes the only viable option for, say, narrow passages between houses; a thinner profile can deliver the required U-value without rendering the passage unusable. In the same vein, one of the many building elements you have to consider on retrofits is the roof overhang. Again, a thinner insulation profile may obviate the need to extend that overhang. Phenolic insulation is fireproof and is generally available in 10mm increments from 20mm to 100mm, though it is possible to double up in certain situations – assuming trained, certified fitters. Practitioners say that it does tend to require thicker base coats and additional fixings compared to other insulations – this contributes to the higher costs involved. It must be kept dry during installation. Manufactured since the 1940s, the process of extruding foamed polystyrene results in a material with uniformly small, closed cells, which gives the foam superior rigidity, making it highly resistant to compression, and a thermal conductivity of circa 0.34 W/mK. XPS has natural resistance to rain, snow, frost and water vapour, and is an exceptionally stable material, retaining its initial insulation performance and physical integrity in exposed conditions over long durations. Properly installed, XPS boards have a service life comparable with that of the building or structure. XPS is commonly used for the plinth detail, below DPC in many external insulation systems, because of its unique benefits – but it can be used for a whole wall system. Wood fibre EWI has the best green credentials. With a thermal conductivity in the region of 0.039 W/mK however, you do need more of it to deliver equivalent thermal performance. It’s also a little more expensive than mineral wool, is fully breathable (again when used in conjunction with the right finishes and adhesives) and is more commonly found on timber frame structures. The fibrous structure of the wood allows it to accumulate and store warmth during the day, then release it at night when the temperature drops, delaying the occurrence of condensation on the surface and thereby making the finished render less susceptible to mould and algae growth. Oversight and quality control is absolutely vital when installing EWI. You can have the best system in the world but unless it’s installed by tradespeople who know what they’re doing, it will fail, and product failure isn’t just about under-performing insulation. Poor workmanship, poor detailing, poor planning and inadequate dialogue between the trades and professionals involved can end up damaging the structure, and seriously compromising indoor air quality. It’s vital that the installers are both trained and recommended by the manufacturer. In Ireland the NSAI runs a register of EWI installers, which involves auditing installers’ work. Meanwhile in the UK the Insulated Cladding and Renders Association (INCA) includes contractors among its members, who are required to have health and safety certifications and UKAS certified managements systems such as ISO 9001 or PAS 2030, and SWIGA, the Solid Wall Insurance Guarantee Agency, operates a robust quality and technical framework backed up by an independent surveillance scheme monitoring installations carried out by its members. This is important: On grant funded Irish projects, double check the day before the project begins that the contractor is still registered with the SEAI, and contact the agency to ensure that the contractor’s insurance cert and tax clearance are still valid. Detail photos from an external insulation project in Wicklow by passive house architects MosArt, showing (clockwise from top left) old concrete sills cut back for installation of new external insulation; windows mounted proud of the original walls for placement in the new external insulation layer, with Compacfoam thermal break at window sill and heavy duty EPS insulation below the damp proof course; installation of the 240mm graphite EPS external insulation system; the EPS cut to fit into the eaves; installation of the Parex render system to the external insulation; the finished house after rendering. While the concept of EWI itself is simple, the process of installing it is not. That’s particularly true in retrofit situations, where a variety of issues need to be taken into account. On retrofits, the process of fitting EWI moves windows and doorframes outside the insulation zone. Best practice would advise moving them forward into the new insulation zone, but because this is an expensive option, it’s rarely done unless window replacements are also planned. The reveals now comprise a substantial cold bridge, so it’s vital that the design team creates a detail to deal with that. Particular care must be taken with sill overhangs, while the sides of the sill are sometimes insufficiently robust to prevent moisture ingress. For that reason, close co-ordination is required between the window supplier, the contractor, the architect who details the junction and the EWI installer. In Germany, it’s become increasingly common to fit a flashing to the underside of the sill to allow any moisture to drain away. Another key vulnerability in retrofits lies at the point where the wall insulation meets the roof insulation at the eaves. In traditional roof design, the rafter is fitted over the wallplate using a birdsmouth joint. Structurally, this makes perfect sense, but from an insulation point of view this detail squeezes the available space in which to fit insulation down to almost nothing. This is an issue with all retrofits, no matter what type of insulation you’re using. Remediating the problem is difficult, physically demanding work. The eave soffit has to be removed and a piece of high performance insulation – cut to the exact size of the space – has to be fitted. It should also be said that unless an appropriate roof detail is specified at design stage, this issue can and does frequently arise with new builds as well. If the thermal bridge remains, it will represent a weak spot in the thermal envelope which could lead to condensation and mould growth, with its attendant impact on indoor air quality. For the record, it’s also important to cite the vital importance of adequate ventilation in your project – whether new build or retrofit. Other critical junctions that the design team must tackle include around cable boxes, gutters and below the DPC. System providers will all have standard details which should be reviewed carefully during the planning stages, and any amendments made in time to brief the trades involved. All 22 EWI systems currently approved by the NSAI use both adhesives and mechanical fixings. Adhesives are used to seal and bond the board to the substrate, to prevent it from bowing during temperature changes, and to ensure there will be no air circulating between the insulation and the wall against which it is bonded. If air does get in there, it can prevent the insulation from achieving its specified U-value. All systems also require a minimum number of mechanical fixings. Modern fixings are thermally broken and do not in any way compromise the effectiveness of the system. It’s advised that wind loadings are calculated on exposed buildings in order to determine whether additional fixings are needed. Additional fixings may also be required if the surface of the wall is brittle, dusty or layered with flaking paint, which could affect adhesion strength. (left to right) External insulation has a longer history of use in Ireland than is commonly known. The Aerobord offices in Askeaton, Co Limerick were externally insulated with EPS in 1966; in 2010 Aerobord tested samples of the original insulation, which indicated that its thermal conductivity was the same as when it was first fitted; the Green Building in Temple Bar was externally insulated with 100mm of Rockwool and an Eglinton render in 1994, and it has been performing well ever since. There are a wide range of options here, but two standard ones – ready-to-use wet renders and what are known as mineral renders. The former come to site in a bucket, pre-tinted to the required colour – so no painting necessary. These ready-to-use finishes also come in different grain sizes, from 0.5mm to 3mm depending on the texture required. Some incorporate an anti-microbial agent to inhibit mould and algae growth. These biocides are very helpful in preventing the discolouration that can blight the appearance of renders over time. Staying with the ready-to-use option, you can choose between basic acrylics and silicon based renders. An acrylic render contains an acrylic resin to make it water resistant and less prone to cracking. It’s generally cheaper than the other options because it only requires one coat. It’s flexible, long lasting and holds its colour well. It is not breathable however, so it doesn’t make much sense to use it with a breathable EWI like wood fibre or Rockwool. Silicon based render has become a lot more popular in recent years, to the point where it dominates the market. Like acrylic, it’s flexible and won’t crack. You can get self-cleaning silicon renders for a low maintenance finish. Experts favour these renders for projects in close proximity to motorways, where particulate matter can cling to walls. Its resistance to water also makes it a great option for coastal regions, where salt can attack the face of the render. The key characteristic of silicone renders is their breathability, which makes them a natural fit with breathable EWI. Mineral renders come in a bag – you just add water and mix. They’re sand and cement based and are breathable. They can be coloured, they can have different textures and can also come as either thick coat monocouche types or as thin coat render. Naturally enough, they are more labour intensive, and because you have to mix onsite, getting consistency in colour isn’t always easy. Mineral renders dry more quickly than their ready-to-use equivalents – so in uncertain weather conditions, they do offer something of an advantage. Brick slip cladding is another option. Brick slips are thin slices of masonry which perfectly mimic the appearance of traditional brickwork. Skilled plasterers can also replicate this type of finish with renders. Getting the finish right is as important as getting the insulation type right. Take the time to assess your building, taking into account where it is and what it will be exposed to before choosing the most appropriate product. Mild, dry, non-humid weather provides the best conditions in which to install EWI. From the installation of the board, through to the application of the range of specialist tapes and seals at junctions and windows, right through to the plastering itself – it’s vital that moisture not be allowed in or behind the EWI system, because it can lead to potential failure. Wood fibre and phenolic systems are particularly vulnerable and cannot be allowed to get wet during installation. Dry conditions are also best for applying render finishes. For one thing, it is difficult to plaster onto wet surfaces. For another, heavy rains can wash off primers and other protective coats, leading to a situation where they need reapplication, with a knock-on impact on cost. Manufacturers frequently recommend fixing tarpaulin or an equivalent protective layer to the outside of the scaffolding throughout the installation and rendering phase. That’s going to be particularly important in exposed areas, coastal areas and in places where wind-driven rain is a particular risk. As an alternative to a rendered finish, it’s possible to batten and clad, giving you a drainage cavity that allows any moisture that gets through the external layer to drain away. This is a more forgiving spec, because if moisture does get in during construction and indeed over the life of the building, it can be dealt with. This kind of finish is sometimes recommended in more exposed locations. That said, a high-spec silicone render can be equally effective in harsh environments. Care should also be taken to avoid rendering during very hot weather or during very cold weather. Generally speaking, you don’t want temperatures below 5C or above 25C. Follow the manufacturer’s instructions to the letter. The combination of professionally applied EWI and one of the modern renders will give you a finish that will not crack as a result of movement. There’s a high degree of flexibility built into the system – from the boards themselves through the fixings and the finish. A reinforced mesh fitted over the insulation and under the render also adds to the robustness of the surface, making it highly resistant to impact. Well finished EWI can withstand the usual punishments a building must take – low level impacts/balls being played against it and so on. A long list of schools have been retrofitted with EWI. While best practise requires an airtight internal envelope in order to prevent warm air escaping and water vapour from penetrating the structure, you also need a wind-tight external envelope to make sure that the insulation works as intended. Correctly fitted, with sealed junctions and joints, EWI provides an excellent wind tightness layer that will be critical in preserving the U-values of the materials you will use in your project. Some insulated boards are also tongued and grooved, which lends further assistance in this area. That said, it’s important if externally insulating a cavity wall that the cavity itself also be pumped in order to avoid allowing any airflow between the heated space and the insulated space. The smallest gaps in the EWI could end up creating airflow in an uninsulated cavity, and that can have a significant influence on thermal resistance, which in turn will lead to underperforming insulation. To put it another way, wind tightness doesn’t so much improve U-values, rather, it allows you to achieve the specified U-values. A wide variety of finishes are available for external insulation systems, such as (left to right) silicon render, which is regarded as flexible, ‘self cleaning’ and low maintenance; mineral render, which is sand and cement based and mixed on site; and brick slip cladding, essentially thin slices of masonry designed to accurately mimic the appearance of brickwork, and seen here in a particularly unusual architectural form. It’s a question passive building practitioners are frequently asked. What role does EWI play in achieving airtightness in the structure? The short answer is very little. 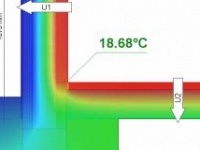 Airtightness relies on a continuous air impervious layer, with minimal junctions or gaps. EWI, by its nature, will have numerous penetrations at windows, doors, service junctions and so on. In short, you cannot rely on EWI to double as your airtightness layer. There’s a secondary point to make here that’s no less important. In timber frame structures, the airtightness layer also acts as a vapour control layer. Therefore, even if we were to assume that it was theoretically possible to deliver airtightness using external insulation, the absence of a vapour control layer on the warm side of the structure could cause serious problems down the line. Moisture vapour moving through the structure could condense before it reaches the outside – and even if it doesn’t, you are open to the risk of prolonged periods of high humidity, generating both structural risks and poor indoor air quality. Typically in Ireland and the UK, EWI manufacturers will offer some form of material warranty. The lengths of these warranties vary - check with the system provider in question for details. Also, under grant-aided SEAI schemes, installers must give a two year workmanship warranty. Some systems also offer an insurance-backed warranty. Again, details can vary, so ask for policy details. 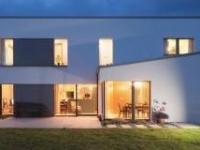 The National Insulation Association of Ireland is currently scoping out a guarantee scheme which would offer cover of up to €20,000 out to 25 years, and would include defective materials, design and workmanship. 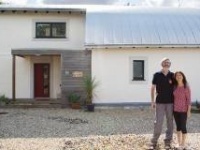 Passive House Plus will be keeping an eye on this and will report on any developments. On the wider subject of consumer protection, there are many voices within the building industry who would like to see a greater role for latent defects insurance or LDI. LDI offers ‘no fault’ protection to homeowners against serious structural defects. You don’t have to go to court and pin the blame on anyone to get the problem remedied. LDI is compulsory in France, but is less common in the UK and almost unheard of in Ireland. Insurance backed guarantees are now well established in the UK. SWIGA, the Solid Wall Insurance Guarantee Agency, was set up to give householders an independent, uniform and dependable guarantee covering professionally installed insulation systems. The SWIGA quality framework ensures that all stages of the work, from survey to design and installation are carried out by competent companies using skilled people, and that it is guaranteed to meet high standards. Life cycle analysis will help point the way towards the most environmentally sustainable construction methods and materials. For the moment however, this discipline is still in its infancy. In its absence, it is difficult to make definitive statements about the credentials of the different materials. While it’s not controversial to say that wood fibre is the most sustainable of the EWI products on the market at the moment, without knowing specifics about sourcing, about the supply chains of the different products, about the context of the building, comparisons are tricky. For example: Judicious use of steel may remove the need for a much larger proportion of concrete in the building, and yet pound for pound, steel is the more polluting product. Context is everything. Environmental Product Declarations or EPDs are standardised indexes of the environmental credentials of a particular product or system. These are becoming more common, and they do form an important element of life cycle analysis. It’s worthwhile asking for an EPD when choosing a system, but we’re still quite a way from the point where we can make robust comparisons in relation to particular buildings. It is however worth making the general point that a robust fabric-first approach – which includes EWI – will continue saving energy for decades after high-tech energy saving solutions have reached their end of life. is it really possible to insulate in this way?